To earn approval for its Apple 2 Campus in Cupertino, Apple agreed to increase the number of employees using transportation like bicycles and shuttles, according to a new report on commuting in Silicon Valley from The Los Angeles Times. Apple maintains a Transportation Demand Management program that gives 1,600 of its employees free rides to and from work, using environmentally friendly biodiesel that cuts down on the number of employees using cars. The program has a budget of $35 million, which works out to a cost of approximately $21,875 per employee for transportation at the current point in time. Apple has a Transportation Demand Management program with an annual budget of $35 million and the goal of getting as many employees as possible out of their cars. It runs the company's fleet of shuttles, all biodiesel, that on average 1,600 employees ride for free each day. The current system provides more than 200 service runs from 55 pickup locations around the Bay Area. Employees can download an app to track the location of the shuttles. Currently, 28 percent of Apple employees ride bikes, walk, or ride shuttles to work, a number that the company hopes to increase to 34 percent. 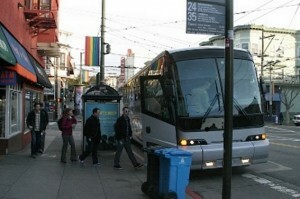 To boost the number of employees using alternative transportation, Apple plans to add more shuttles and buses. A dedicated transit center with eight parking bays is also under construction, with an ultimate goal of having as many as 76 buses and shuttles moving through the center with a park time of three minutes or less. Commuter shuttles from companies like Apple and Google have become a somewhat controversial issue in San Francisco as of late, subject to several protests over the course of the last few months. Recently, the San Francisco Municipal Transportation Agency approved a proposal that requires commuter shuttle buses from companies like Apple to pay $1 for each stop they make every day, which is expected to earn the city approximately $1.5 million over the course of 18 months. The program is set to begin in July. Sure cause we all know the government is so much more efficient in handling money than the private sector. Sure cause we all know those roads are somehow magically maintaining themselves through the wonders of capitalism. $21,000 per employee?! Wouldn't be be more efficient to just give $30 million to the local transportation authority is to build more roads and general-use mass transit? Fewer cars on the street is a good thing and these types of programs should be encouraged. Unfortunately, perks like free rides to and from work always seem to go to the people who least need them -- like relatively well off tech employees. I'm sure such a service would make a huge impact on someone working for minimum wage that actually has to pay for transportation. As someone who has used this "perk" for years, and know many more who use it daily as well, I could not imagine the roads around Apple with 28% more traffic. The fact that Apple has the willingness to "take" from the bottom line for the good of the environment, congestion of traffic, and less stress for employees should be applauded. Not to mention the relief of traffic up and down the 101, 85, 280, routes to-and-from SF, SJ, and Gilroy, as well as De Anza, Lawrence, Stevens Creek. The busses and shuttles serve employees in many other surrounding cities, and a few less cars on the road should be encouraged. Who cares what Apple's cost per employee is claimed to be? The fact is, they have this program in place, want to do better with it, yet most of you can only criticize? They have the means, why not use some of it for a little offset to a carbon footprint.. This is good news. Apple continues to lead the way in its strategic approach to green corporate policies. An extensive public transit system like that serviced by the busses would likely cost closer to $30 Billion not $30 million. (Assuming its using metro rail). And yet Apple maps still can't tell me how to get to work via public transport. Hardly. All of the Silicon Valley tech firms provide these busses, and they all share the responsibility for building huge office complexes in areas with inadequate housing opportunities. They are creating the commuting issue in the first place, so in my book they get no gold stars for making it a little less of a problem than it could be.